Featuring exhibitions from world-renowned artists alongside new arts stars of tomorrow, The Levinsky Gallery offers a sometimes provocative, sometimes beautiful and always thought-provoking experience. 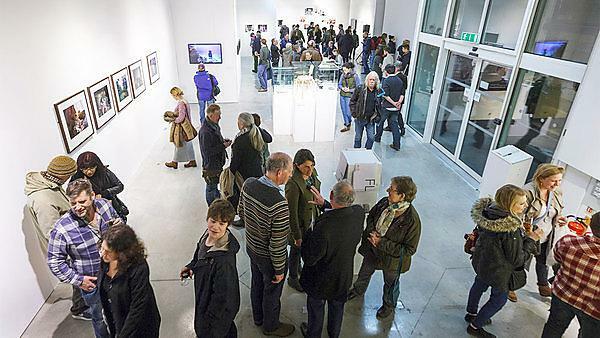 Based in the University's Roland Levinsky Building, it is the largest contemporary art gallery in Plymouth. All exhibitions are free and include associated events for you to learn more about the artists and exhibits through gallery tours and artist and curator talks, as well as fun events for all the family. Previous featured artists include: leading UK Photographer Jem Southam, award-winning artist Trevor Bell, Turner-prize winning artist Douglas Gordon, leading graphic designer, Ivan Chermayeff, Dorothy Cross, one of Ireland's leading international artists and internationally acclaimed artist and sculptor, Peter Randall-Page. f "A fantastic opportunity to see established and upcoming artists. An amazing space!"
. "Beautiful and inspiring work by Jem Southam!" i "An incredibly uplifting yoga session in the gallery this evening, amongst some of Trevor Bell's finest works!" The Levinsky Gallery is open Monday-Friday 10:00-17:00 and on Saturdays between 11:00-16:00. It is closed on Sundays and bank holiday weekends. If the known unknowns are the things we know that we don’t know, what don’t we know that we know? Plymouth-based Curator, Vickie Fear, brings together artists using appropriated material in 'The Unknown Knowns' exhibition to expose hidden truths and ask questions about the world we live in. Starting with the work of three filmmakers commissioned by The Arts Institute in partnership with the SWFTA in 2018, 'The Unknown Knowns' makes connections between artists who draw from a range of sources, including public archives and popular culture. This is a partnership exhibition delivered by The Arts Institute and The Box, Plymouth and is on display from Friday 29 March - Wednesday 22 May in The Levinsky Gallery. Find out more about the exhibition. Running alongside the School of Art, Design and Architecture Graduate Show 19, the Alumni Show brings together some of the finest alumni from the school including artists, designers, filmmakers, illustrators, photographers and architects, who since graduating have built successful careers within their respective fields. Come and see how our creative alumni are making their mark on the world.